Falling capacity prices have motivated satellite operators and service providers to envision new ways to generate revenue. Consolidation is a key strategy, as seen by GEE’s deal with EMC/MTN and Panasonic’s acquisition of ITC Global. However, while the drop in pricing is leading to a rise in broadband adoption, the narrowband market opportunity remains sizable, and may provide additional strategies for producing value. Despite the waves made by HTS and crew welfare in the offshore vertical, merchant maritime will remain primarily a narrowband play, thanks to M2M/IoT and the drive for data analytics. Container tracking, reefer management, and fleet management systems all are “must-haves” and are becoming part of the standard offering to shipping end-users as ways to improve business efficiency. Applications such as decreasing inspection times, cargo temperature monitoring, and preventative maintenance provide positive economic feedback to merchant vessels, incentivizing investment in narrowband services. Tracking vessels or containers, via sensors directly connected to a satellite network, has the advantage of not interfering with, nor competing against, maritime broadband or terrestrial services. This allows some flexibility where a service provider may be able to complement their current offering with a narrowband play, or bump alongside a vessel’s existing satellite service. With the advance of big data analytics offering constant assessment of a fleet and its contents, the average merchant maritime vessel will have 5 in-service narrowband units, or sensors, by 2025, growing from the 2 already in place now. Voice calling and safety-oriented services were the original motivation for maritime SATCOM, and that demand is still prevalent today. While regulations and voice applications remain a large part of the narrowband push in fishing fleets, without external value-propositions, the adoption stops there. In the case of commercial fishing, SATCOM adoption is driven not so much by business needs, but more by regulatory mandates. As such, growth in this vertical will remain slow and unevenly distributed. There has been growing demand for increased monitoring and data analytics in maritime waters in some regions, as seen with exactEarth’s alliance with Digital Globe, and e-GEOS’ SEnSE software, but without direct economic feedback to the fishing vessels themselves. Even with an expanding list of value-added services offered by service providers, the value-proposition is just not there for commercial fishing fleets. Amidst the buzz seen in the SATCOM industry today, it is easy to forget about the smaller fish. The maritime industry’s buzz centers around flat panel antennas, higher throughput for crew comfort and operational efficiencies. These aspects will draw large revenues and thus most of the attention. But the fact remains that satellite operators and service providers, especially in the maritime business, are moving throughout the value chain, looking for ways to increase revenues and more ways to “monetize the bits” they provide. Merchant shipping provides an excellent opportunity for narrowband services, as everything can be tracked and optimized, from the vessel, its engines, down to the containers themselves. 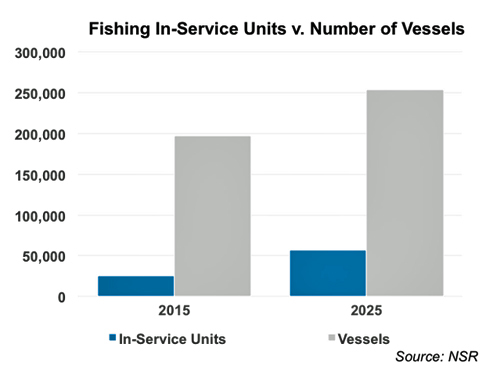 The traditionally economically-restricted commercial fishing sector may also seem like an unlikely place to expand business, but with 250,000 fishing vessels served by only 55,000 narrowband units by 2025, there’s plenty of fish in the sea, if you know how to catch them. Executive Summary of the Maritime Satcom Markets, 4th Edition, by Dallas Kasaboski, Analyst, NSR France.